The Mariama Nursery School in Gunjur (south Gambia), is the brainchild of Alison Calvert who first visited Gunjur village in 2000. Her remit was to help teachers understand how best to help children with learning difficulties. 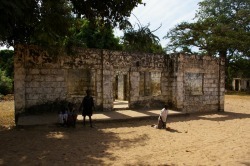 At that time she managed to persuade the local school to accept Mariama (a severely physically disabled child) into mainstream education – a major achievement since it is commonplace in third world countries for children with physical or mental disabilities to be isolated and confined to their own homes – thus receiving no education whatsoever. Following extensive negotiations, fundraising and work on the ground, the Mariama Nursery School opened in September 2008, with two classrooms in the grounds of Gunjur Lower Basic School. 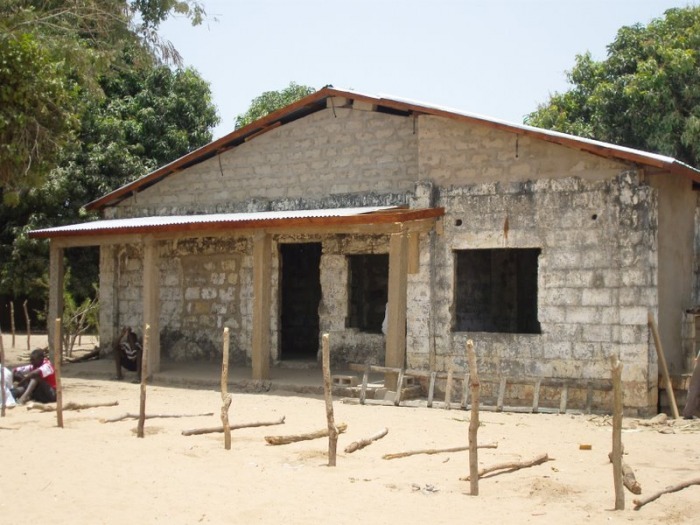 The nursery is now providing inclusive education for local children up to the age of seven, and is it is hoped that in the future we will be able to support the creation of a third or even fourth classroom. Gunjur Lower Basic School, which caters for approximately 1,600 pupils aged 7-14, is also the location for other project in that area – the creation of an on-site primary care clinic facility. Thanks to generous donations from our supporters, notably Greggs of the Midlands employees, this important new facility is due to be completed by November 2008. To see more pictures of this amazing project, click here. For news and updates on the nursery school, visit our news diary here. To support our ongoing work in Gunjur, click here. Or click here to return to The Projects menu. 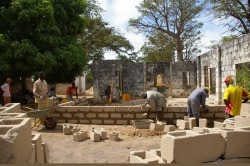 Above: The building of Mariama's Nursery School.